The first week of December saw an arctic front blanket much of the country with subzero temperatures, snow and ice. Travelers were stranded in airports for days, household pipes were frozen and children left the house in multi-hued layers of clothing. It’s only December, and there’s a high likelihood of another arctic blast or two hitting before the end of February. While it’s natural to protect our children from the discomfort of freezing temperatures, our dogs feel the temperature change, too. When it comes to canines, there are a few simple precautions you can take to protect them at home and in the field. Provide proper shelter: If your dog spends his day outside (and hunting dogs should spend some time outdoors to acclimate to dropping temps), he needs shelter from the elements – snow, rain, wind, sun, heat and cold. A dog house with insulation of some sort is all that’s required. Canines have evolved to keep themselves warm, so just giving them a spot to get off the cold ground, some blankets or hay to nest in and a roof over their head is all that is required. You can augment the basics with heat sources such as mats or heaters, but it’s not necessary except in extreme cases. Increase feed: Just like with wildlife, a dog's metabolic needs increase when temperatures drop; it takes calories to stay warm. Increase food rations slowly and feed to the dog’s body condition – here’s how to gauge proper body condition. Boot up! Snowfall can create a beautiful winter wonderland. But when arctic temperature follow, the snow will often become crusted on top. That top layer of ice crystals can turn the serene winter scene into a painful experience for your dog. A set of boots can protect your dog’s footpads, feet and even ankles from cutting ice. Be sure to get a set that rides high on the ankle, take a trial run or two at putting them on your dog and let them get used to wearing the coverings, and know that you’ll likely have to tape the boots on. Coats? For the most part I don’t like coats and sweaters for dogs. Canines have evolved perfectly to stay warm. However, different breeds will experience cold temperatures differently from one another. 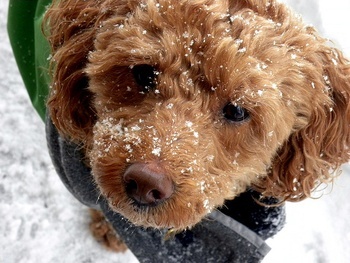 For thin-skinned dogs or those with short hair, a coat or sweater might help them deal with the cold and protect them from precipitation while outside for an extended time. Be careful, however, as an exercising dog generates internal body heat. Provide cool water: Keeping fresh, cool water available at all times is a no-brainer when it’s 100-degrees outside, but many people aren’t always as vigilant when it’s 10 degrees. Regardless of temperature, your dog needs access to clean, cool water at all times. If your dog is outside for much of the day, you can buy a heated bowl to keep the water ice-free. Never felt right putting actual boots on a dog. But we do use Invisible Boot, which is the Canadian equivalent to Musher's Secret.